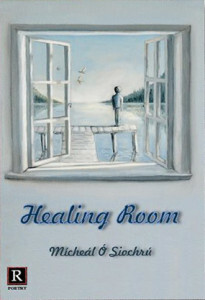 Healing room is Mícheál O’Siochrú third poetry collection in English is an intriguing journey from the pandemonium of the opening poem “The Attic” to the silence of “Healing Room”. Mícheál O’Siochrú is a native of Baile an Sceilg Gaeltacht, South Kerry. He has written extensively in the Irish language and has had two collections of poetry and a novel published by Coiscéim. His poetry has won various Oireachtas prizes as well as first prize at Listowel Writers’ Week. A renowned Irish teacher, he has taught in Rosary Hill and Vocational School, Castleconnell, Co Limerick, in Villiers, St. Clement’s and Limerick Tutorial Colleges as well as in Mary Immaculate College.